Giro d’Italia? What’s that? I hear you say. Well, for anyone who has thumbed past page one in the cycling-for-dummies handbook (no, that does not exist) it is the second most famous race in the world, only beaten by a certain Tour de France. But don’t tell the Italians that. 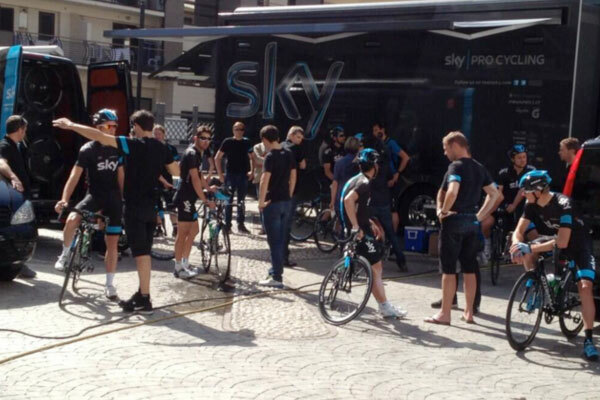 For Italy, the Giro is the big deal in Pro Cycling. When young Italians are still racing around the garden on stabilizers, it is not the Tour de France they dream of winning. The first of the Grand Tours each year, the Giro is often as tough, if not tougher than the Tour de France. The sheer peaks of the Dolomites in Northern Italy are the proving ground of the victors of this race, combined with a collection of tough sprint stages where the racing ends up in ‘warp speed’, according to the cyclist David Millar. The 2011 version of the race was viewed as one of the toughest Grand Tours ever, thanks to the sheer volume and ferocity of climbing in the mountains. ‘La Corsa Rosa’ (literally translated as ‘Pink Route’) is held in such high regard that cyclists are often not considered great champions until they are able to add the Giro’s very sizeable trophy to their cabinet. The race’s history is similar to that of the Tour de France – 95 editions of the Giro have been held, and the race was originally started, and is still owned, by RCS – owner of La Gazzetta Dello Sport, Italy’s leading sports newspaper (much like L’Equipe in France). The pink colour of the leader’s jersey reflects the colour of La Gazzetta‘s paper. I was on the race last year with the team before I started this blog, and I’m looking forward to every second. Rewind to earlier this year. When asked back to join the team on the road again, excitable was an understatement. Plus, it was rumored that a certain newly appointed knight of the realm was going to contest it. We’re going to split the time up a bit this year, so I’ll be on the Giro, and then handing over to my best friend, and long time colleague Neil – who was with Team Sky all the way back in 2011, so they’ll be in safe hands. I’ll be back for the Tour of Britain though! After counting down the months, weeks, and days, the Giro is finally here. I’m writing this in Naples where the race starts after the small matter of a two thousand-kilometre drive to get here with my equipment for the team’s race cars. It’s funny; as soon as I arrived I felt like I had never been away. 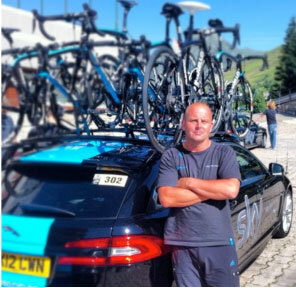 The mechanics were all in the truck making clinking noises and solemnly nodding with satisfaction every now and then, the rider carer team were buzzing around doing endless kit checks, and Claudio the bus driver was looking very pleased to be in his home country. I look forward to history lessons about the many Giri that Claudio will have watched over the years, which will be delivered whether I like it or not, I am sure! I just got straight in to checking over the cars before the race after a few smiles and handshakes with some of the team who had been on the races last year. The owner of the hotel even had a classic Jaguar, so I gave that a quick once over too. Then something quite special happened; a pat on the back, a smile and a nod from our Sir Bradley. “Great to see you again mate!” he exclaimed. I wasn’t really sure what to say, or whether I should bring up the fact that since we last saw each other, he had won an Olympic gold medal (his fourth), been knighted, made sports personality of the year, and rocketed to become one of the nation’s most loved characters. I figured he was pretty tired of people congratulating him, so we just had a chat about the race ahead and it being nice to be back with the team. Not a bad place to work, this.